constructMeshesFromGeometry is a conversion tool for the gml files. Given a “bulk” mesh and the gml geometry file the tool generates meshes for all named geometries. 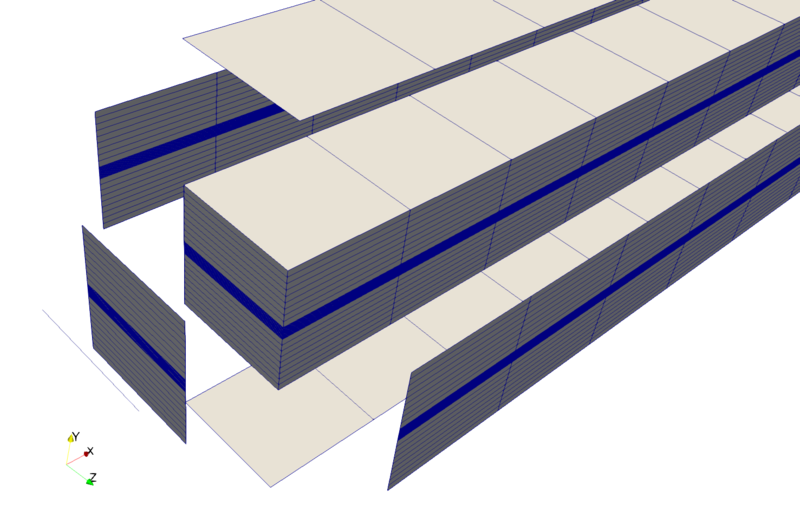 The meshes are used for the boundary conditions and provide node ids and element ids mappings to the bulk mesh. debug: Reading geometry file '../s/Tests/Data/LIE/HydroMechanics/single_fracture_3D.gml'. debug: Project configuration from file '../s/Tests/Data/LIE/HydroMechanics/single_fracture_3D.gml' read. debug: The search length for mesh "single_fracture_3D" is 1.000000e-09. debug: Creating mesh from geometry single_fracture_3D inlet. debug: Creating mesh from geometry single_fracture_3D outlet. debug: Creating mesh from geometry single_fracture_3D left. debug: Creating mesh from geometry single_fracture_3D right. debug: Creating mesh from geometry single_fracture_3D front. debug: Creating mesh from geometry single_fracture_3D back. debug: Creating mesh from geometry single_fracture_3D bottom. debug: Creating mesh from geometry single_fracture_3D top. yields new meshes for each named geometry: single_fracture_3D_inlet.vtu, single_fracture_3D_right.vtu, single_fracture_3D_outlet.vtu, single_fracture_3D_left.vtu, single_fracture_3D_front.vtu, single_fracture_3D_top.vtu, single_fracture_3D_bottom.vtu, and single_fracture_3D_back.vtu. The figure shows the front part of the mesh with the extracted geometries. Note, the lower dimensional inlet boundary, shown as a line.